bDepartment of Public Health Sciences (P.J.N. ), Medical University of South Carolina, Charleston, South Carolina. MATERIALS AND METHODS: In this single-center, retrospective study, the signal intensity of the globus pallidus, dentate nucleus, thalamus, and middle cerebellar peduncle was measured on unenhanced T1-weighted images in 29 adult patients who had undergone multiple contrast MRIs using exclusively gadobenate dimeglumine (mean, 10.1 ± 3.23 doses; range, 6–18 doses). Two neuroradiologists, blinded to the number of prior gadolinium-based contrast agent administrations, separately placed ROIs within the globi pallidi, thalami, dentate nuclei, and middle cerebellar peduncles on the last MR imaging examinations. The correlations between the globus pallidus:thalamus and the dentate nucleus:middle cerebellar peduncle signal intensity ratios with the number of gadolinium-based contrast agent administrations and cumulative dose were tested with either 1-tailed Pearson or Spearman correlations. A priori, P < .05 was considered statistically significant. RESULTS: Both the globus pallidus:thalamus and dentate nucleus:middle cerebellar peduncle ratios showed significant correlation with the number of gadolinium-based contrast agent administrations (r = 0.39, P = .017, and r = 0.58, P = .001, respectively). Additionally, the globus pallidus:thalamus and dentate nucleus:middle cerebellar peduncle ratios showed significant correlation with the cumulative dose of gadobenate dimeglumine (r = 0.48, P = .004, and r = 0.43, P = .009, respectively). Dentate nucleus hyperintensity was qualitatively present on the last MR imaging in 79.3%–86.2% of patients and in all patients who had received >10 doses. Gadolinium-based contrast agents (GBCAs) are extensively used in evaluating both central nervous system and non-CNS pathologies with MR imaging and provide critical diagnostic and treatment-guiding information. All GBCAs are composed of gadolinium and a chelating agent. Because gadolinium is an extremely toxic substance, chelating agents are designed to prevent release of gadolinium in the body before renal excretion. Likewise, Schneider et al26 reported no increase in the T1-weighted signal intensity of the DN in pediatric patients who had been exposed to a mean of 7.8 injections of gadobenate dimeglumine; however, the agent was administered at half dose (0.05 mmol/kg). On the other hand, a study by Weberling et al,25 found a significant increase in the T1-weighted signal intensity in the DN after serial injections of gadobenate dimeglumine but not a significant correlation between the DN-to-pons ratio and the accumulated dose. The patient population in this study was predominantly those with melanoma (47/50 patients), and 14 patients had undergone radiation therapy, which may have confounded the results. Given the discrepancies in the literature, the purpose of this study was to provide further evaluation of gadobenate dimeglumine by assessing a group of patients with various pathologies and no prior radiation exposure to the posterior fossa who had received at least 7 cumulative injections of exclusively gadobenate dimeglumine administered at the full FDA-approved dose of 0.1 mmol/kg. This single-center, retrospective, cohort study was performed after institutional review board approval, with a waiver of informed consent, in compliance with the Health Insurance Portability and Accountability Act. The biostatistician's time was covered by several National Institutes of Health grants. Otherwise, the study was unsponsored. All patients at our institution who had undergone MR imaging of the brain with contrast administration from January 2013 until July 2016 were screened for inclusion in the study with the following criteria: 1) adult patients 18 years of age and older, 2) a minimum of 7 gadolinium-enhanced MR imaging scans (which included the last MR imaging for reference), and 3) all contrast MR imaging examinations performed exclusively with gadobenate dimeglumine. During this time, 11,669 MRIs of the brain with and without gadobenate dimeglumine were performed, and 222 patients had received at least 7 doses of gadobenate dimeglumine. Using both the local PACS and the electronic medical record, we excluded all patients who had undergone a contrast MR imaging outside our facility at any time to ensure documentation of all GBCA administrations. Additionally, to avoid possible confounding variables, we excluded patients with the following: 1) posterior fossa disease obscuring the dentate nucleus or middle cerebellar peduncle, 2) radiation exposure to the posterior fossa, 3) multiple sclerosis or other disease processes associated with intracranial intrinsic T1-shortening, 4) unsatisfactory images due to MR imaging or motion artifacts affecting the evaluation of the posterior fossa, and 5) any history of abnormal renal (estimated glomerular filtration rate at the time of imaging of <30 mL/min per 1.73 m2) or hepatic function as evaluated by routine laboratory tests. MR imaging was performed on either a 3T scanner (Skyra and/or Verio; Siemens, Erlangen, Germany) or a 1.5T scanner (Aera and/or Avanto; Siemens). The standard 1.5T MR imaging protocol included either axial T1-weighted spin-echo (TR, 500–588 ms; TE, 7.7–12 ms; slice thickness, 5-mm; gap 1.0) or 3D MPRAGE (TR, 1780–2200 ms; TE, 2.91–3.37 ms; slice thickness, 1.0 mm; gap, 0.5; FOV, 250 mm) before and after GBCA administration. The standard 3T MR imaging protocol included either axial T1-weighted spin-echo (TR, 500–550 ms; TE, 6.4–8.9 ms; slice thickness, 5 mm; gap, 1.0) or 3D MPRAGE (TR, 1690–2300 ms; TE, 2.3–3.2 ms; slice thickness, 1.0 mm; gap, 0.5; FOV, 250 mm) before and after GBCA administration. Gadobenate dimeglumine was administered as an intravenous bolus using body weight–adjusted dosing at 0.1 mmol/kg per departmental protocol. Two neuroradiologists (M.Y. and S.T.S. ), with 3 and 4 years of experience respectively, evaluated the images. Each reader was independently presented with the initial and final MR imaging of each patient in a randomized, blinded fashion on the PACS workstation and asked to qualitatively determine whether the DN demonstrated T1-weighted hyperintensity on the unenhanced T1-weighted images. The readers were blinded to the number of prior GBCA administrations. In addition, each reader was asked to place ROIs by visual analysis within the GP, thalamus (TH), DN, and middle cerebellar peduncle (MCP) bilaterally, as described by Kanda et al,1 on the last MR imaging scan. The mean signal intensity of each ROI was obtained and used to calculate the DN-to-MCP signal intensity ratio (DN:MCP) and the GP-to-TH signal intensity ratio (GP:TH) for each subject. To test the concordance between the 2 readers concerning the GP, TH, DN, and MCP mean signal intensity measurements, we calculated the Lin concordance correlation coefficient using on-line software (https://www.niwa.co.nz/node/104318/concordance). The Shapiro-Wilk test was used to assess the normality of the data. For the GP:TH ratios, the P value was = .005, indicating that the data were not normally distributed; therefore, a Spearman correlation was used to investigate the relationship between the GP:TH ratios on the final MR imaging examination and the number of administered GBCA doses as well as the total cumulative dose. For the DN:MCP ratios, the P value was 0.786, indicating a normal distribution; therefore, a Pearson correlation was used to assess the relationship between the DN:MCP ratios on the final MR imaging examination and the number of administered GBCA doses and the total cumulative dose. Statistical significance was considered at the α = .05 threshold, and 1-tailed P values are reported (SPSS, Version 23; IBM, Armonk, New York). Twenty-nine patients met the inclusion/exclusion criteria during the study period, and the patient characteristics are described in the Table. The mean age of the patients was 52.1 ± 17.1 years. There were 20 men and 9 women. Most patients underwent imaging for the diagnosis of neoplasm. The mean number of prior GBCA administrations was 10.1 ± 3.23 doses (range, 6–18 doses). Note that 2 patients received only 7 GBCA administrations; therefore, at the time of the last enhanced MR imaging used for measurement, these 2 patients had previously received 6 GBCA doses. Cumulative doses of gadobenate dimeglumine ranged from 76 to 316 mL, with a mean of 175.2 ± 59.05 mL. Concerning ROI measurements within the GP, TH, DN, and MCP, the value of the Lin correlation coefficient between readers ranged from 0.97 to 0.99, indicating substantial-to-near-perfect reader concordance. Therefore, the measurements from both readers were averaged. 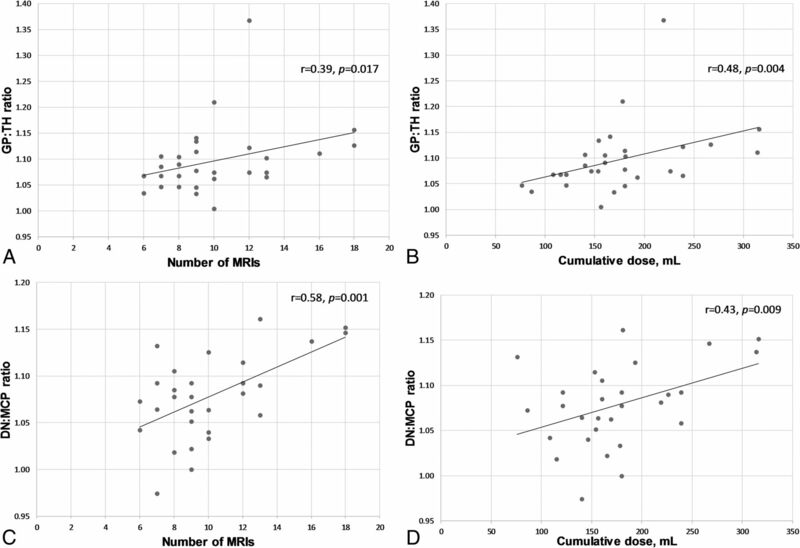 The GP:TH and DN:MCP ratios on the last MR imaging both showed a significant correlation with the number of previous GBCA administrations: r = 0.39, P = .017, and r = 0.58, P = .001, respectively (Fig 1). There was also a significant correlation between the cumulative doses of gadobenate dimeglumine and the last GP:TH ratios (r = 0.48, P = .004) and the last DN:MCP ratios (r = 0.43, P = .009). Graphs of the GP:TH and DN:MCP ratios plotted against the number of GBCA enhanced MR imaging scans (A and C) and the cumulative dose of gadobenate dimeglumine (B and D). Higher doses of gadobenate dimeglumine resulted in qualitatively visible hyperintensity of the dentate nucleus on the final MR imaging examination as reported by readers 1 and 2 in 79.3% and 86.2% of the patients, respectively (Fig 2). Both readers reported dentate nucleus hyperintensity in all patients who had received >10 doses of gadobenate dimeglumine. Concerning agreement between the 2 readers on the qualitative presence or absence of T1-weighted hyperintensity within the dentate nucleus on the final MR imaging, κ = 0.77, P < .0005 indicated substantial interobserver agreement. Unenhanced, axial T1-weighted MR images through the dentate nucleus in a 54-year-old man with metastatic renal cell carcinoma after the administration of 1 (A), 8 (B), and 18 (C) doses of gadobenate dimeglumine. There is a progressive increase in the T1 signal intensity in the dentate nucleus (arrows). In this study, we demonstrate significant positive correlations between the GP:TH and the DN:MCP ratios and the number of previous GBCA administrations and the total cumulative dose. Our findings are in agreement with the study of Weberling et al25 and extend those results to patients with various intracranial pathologies without the potential confounding effect of radiation therapy. In our study, hyperintensity within the GP and DN was demonstrated following the administration of a mean of 10.1 ± 3.2 doses. On the other hand, no significant increase in T1 signal on unenhanced images was seen in the GP or DN in the study of Ramalho et al,24 following the administration of a mean of 4.6 ± 2.2 doses of gadobenate dimeglumine, but it was present following gadodiamide administered at a mean of 5.0 ± 2.4 doses. The larger mean dose of gadobenate dimeglumine in our study likely explains this discrepancy. Whether the mean dose required to produce T1 shortening on MR imaging is reflective of the rate or the amount of gadolinium deposition associated with a specific agent is unclear because several confounding factors influence the appearance of gadolinium on MR imaging, including the specific molecular species present. Animal and human postmortem studies will be helpful in comparing the various agents and quantifying their propensity for gadolinium deposition. As a GBCA, gadobenate dimeglumine has several unique properties. Due to weak, transient interactions with serum albumin,30,31 gadobenate dimeglumine has high R1 relaxivity in vivo,32,33 resulting in greater signal intensity enhancement on T1-weighted images. In addition to renal excretion, a small percentage of gadobenate dimeglumine is excreted by the hepatobiliary system.34 While gadobenate dimeglumine is a linear GBCA, it has not been associated with a high risk for nephrogenic systemic fibrosis.35⇓–37 However, in animal38,39 and human serum40 studies, gadobenate dimeglumine behaves as would be expected for a linear agent. Therefore, considering the unique properties of gadobenate dimeglumine, it is important to determine whether the agent is associated with T1-hyperintensities within specific regions of the brain. This knowledge is important for performing a clinical risk-versus-benefit analysis. There were several limitations to this study. Patients could have received GBCA administrations at an outside institution without reporting this information to their clinicians; however, in addition to searching the PACS system for imported outside imaging, the medical records were thoroughly screened for any documentation of imaging before presentation to our institution. Varying field strengths and MR imaging parameters were used and precluded the calculation of relative percentage change. Finally, as in all studies of this nature, ROI placement is somewhat subjective and therefore subject to reader bias; however, the readers were blinded to the number of prior GBCA administrations; thus, this subjectivity is not likely to have confounded our study findings. As mentioned in prior articles on the same topic, further studies, particularly those using tissue analysis, should continue to evaluate specific GBCAs and their propensity to deposit within the human body. Furthermore, research evaluating any potential clinical sequelae from gadolinium deposition, both within the brain and other body tissues, should be performed. Continued prudence in selecting patients who should receive contrast-enhanced MRIs is recommended. At higher cumulative doses, as can be experienced by patient groups, such as those with tumors, gadobenate dimeglumine is associated with a significant increase in the GP:TH and DN:MCP ratios on unenhanced T1-weighted images. These data should be incorporated into a risk-versus-benefit analysis when determining the need for GBCA administration in individual patients. While any potential clinical significance is unknown, the iatrogenic deposition of gadolinium within sensitive tissues such as the brain should be minimized in situations where alternative agents with similar clinical efficacy are available. Disclosures: Paul J. Nietert—RELATED: Grant: National Institutes of Health. * Donna R. Roberts—UNRELATED: Consultancy: Guerbet, Comments: advisory board member; Grants/Grants Pending: Guerbet, Comments: investigator-initiated award site Principal Investigator, clinical trial*; Travel/Accommodations/Meeting Expenses Unrelated to Activities Listed: Guerbet. *Money paid to the institution. Paper previously presented at: Annual Meeting of the American Society of Neuroradiology and the Foundation of the ASNR Symposium, April 22–27, 2017; Long Beach, California. Dr Nietert's time on this project was funded, in part, by the National Institutes of Health National Center for Advancing Translational Science (grant No. UL1-TR001450) and the National Institute of General Medical Sciences (grant No. U54-GM104941). Accepted after revision October 30, 2017.